When we were young, it wasn’t easy to connect with people around the world. I grew up in Miami, which is no doubt a melting pot of people and cultures and religions. But, nonetheless, I learned about many foreign cultures, far off countries, and world religions through stories. Through multicultural children’s books, I discovered holiday celebrations like Diwali and learned about wonderful foods like bulgogi and dim sum. I saw traditional Chinese gowns and beautiful saris and families living on kibbutzim in Israel. These days, though, our world is ever so connected and we can speak with a family in Australia or connect with a classroom in Africa in seconds. Which makes diverse books all the more important. Funny I should say that, right? You may be thinking just the opposite - why do we need diverse books if it is so easy to connect with people world wide? Why diverse baby books are more important than ever! In our increasingly interconnected world, we have opportunities to learn from people and children around the globe right at our fingertips. But this, to some, can be daunting. What do you say to someone who appears, at first glance, to be so different from you? How do you respond to language barriers or traditions or lifestyles that seem so wholly foreign? This is where diverse books come in. When we read diverse baby books with babies and toddlers, we are normalizing these differences. We are teaching our children that “others” are beautiful, interesting, and more like them than they may have first thought. When you share a diverse board book with a child snuggling on your lap, your baby will learn to celebrate the world right inside your very own home. THIS is the goal all of us should have for our children. When we teach kids from the time they are infants that learning about the beautiful traditions, people, cultures and holidays around the world can be magical — when we show them that these traditions, people, cultures and holidays around the world share so many similarities to us and ours — we help bridge the perceived divides between us. And when we do this, it helps children be less wary and fearful of differences. Sharing diverse baby books — and diverse picture books — with our children helps our kids become more accepting, more compassionate, and less inclined to feel nervous or scared when they encounter children and adults who they perceive as being different from themselves. So what are you waiting for? Grab some of these diverse baby books, and get to reading! DIVERSE BABY BOOKS: Beautiful and Inspiring Stories! Little You, by Richard Van Camp and illustrated by Julie Flett: This book is an example of understated, elegant literature that is as gentle as a whisper as you read it to your toddler. Simple, lyrical and oh so perfect, this is the story of love parents have for a new baby and the importance that child has in her new home. I dare you to read this diverse board book without choking up! My Heart Fills With Happiness, by Monique Gray Smith and illustrated by Julie Flett: Without explicitly stating it, this gorgeous book celebrates and supports the wellness of indigenous children. It honors those special moments that fill our hearts with joy and encourages children to always remember those things that make them happy. 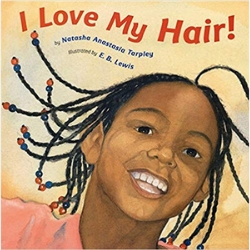 I Love My Hair, by Natasha Anastasia Tarpley and illustrated by E.B. Lewis: This book has become a classic, in print for more than twenty years! This is a wonderful story celebrating the beauty of African American hair. This diverse board book centers around a child named Keyana who discovers that her hair is beautiful - and magical and musical. We adore this story of a child learning to love herself, as well as its beautiful watercolor illustrations. Mama Do you Love Me, by Barbara M. Joosee and Barbara LaVallee: A parent’s love is forever, and this stunning diverse baby book celebrates that very concept as a young child seeks to test her independence. It is a beautiful story of an Inuit mother and daughter, conveying the universal message that a parent’s love is timeless and unbreakable. A tender story combined with exquisite illustrations make this a classic!! 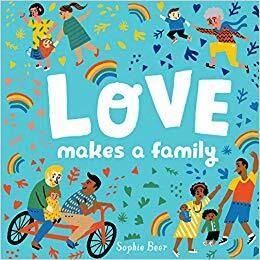 Love Makes a Family, by Sophie Beer: We love inclusive, diverse board books that showcase so fabulously that the most important part of a family is love. It doesn’t matter what your family looks like, or who or how many people live in your home. Instead, family is where the heart is, sharing happy activities together, lending a helping hand, and, our favorite, reading just one more book together before bed. A gem! Dream Big, Little One, by Vashti Harrison: A board book version of the best selling Little Leaders: Bold Women in Black History, this is a perfect, simple book to introduce babies and toddlers to trail blazing women who have accomplished greatness in their respective fields. A perfect gift for a baby girl! Whoever You Are, by Mem Fox and illustrated by Leslie Staub: Around the world, there are children just like yours, kids who laugh and cry and eat and play. Though they live in different places and speak different languages — and maybe even look different, too — this diverse baby book beautiful celebrates how similar we are on the inside. And that, after all, is what counts the most! We Sang You Home, by Mark Van Camp and illustrated by Julie Flett: Another stunner by the Van Camp and Flett duo, one that beautifully speaks to the wishing for, and the subsequent arrival of, a new baby. While the language is definitely more mature, the book is lyrical, poignant and so tender, making it a perfect diverse baby book to share with a new little one who loves nothing more than the sound of your voice! DIVERSE BABY BOOKS: Fun Read Alouds! Peekaboo Morning, by Rachel Isadora: Your baby will love playing peekaboo with the child in this book, who finds his mommy, his daddy, his puppy and even his favorite toy! We have long been fans of Isadora’s work, and we simply adore the vibrant illustrations and simple, interactive text in this diverse board book. Mary Had a Little Glam, by Tammi Sauer and illustrated by Vanessa Brantley-Newton: In this twist on the Mother Goose poem, Mary is a style maven who helps other nursery rhyme characters get their glam on. But will they be too dressed up for recess? A total hoot, especially for your budding fashionistas! Little Chickies/Los Pollitos, by Susie Jaramillo: A fun bilingual book with a coordinating app that tells the story of three chickies (los pollitos) and their mother hen. We adore the way this book highlights unconditional love between parents and children, and, let’s be honest, the song on the app is so much fun and will have you singing for days on end! Please, Baby, Please, by Spike Lee and Tonya Lewis Lee and illustrated by Kadir Nelson: Every parent will relate to this fun and funny book about a little girl giving her exhausted parents a run for their money. From eating sand to middle of the night wake ups, drawing on the walls and not sharing balls, you will laugh, your kids will be delighted, and you will close the book with a big hug and a kiss. Can’t beat that now, can you? How Do You Say I Love You, by Hannah Elliott and illustrated by Shirley Ng-Benitez: I wish I had this when my babes were young, because they would have loved saying “I Love You” in TEN different languages! Complete with fun rhymes, sweet illustrations, and even a handy pronunciation guide, this is a fabulous diverse baby book to take children on a journey around the globe! More More More Said the Baby, by Vera B. Williams: We love this adorable, sing song book about Little Guy, Little Bird and Little Pumpkin! Three short stories about multicultural families make this one special and fun. Your little one will be saying “more, more, more” before you know it! Mommy, Mama and Me, by Leslea Newman: We love this board book that highlights family diversity and alternative family structures, namely, a toddler with two moms. Though their family may look different on the outside, this trio goes about their day just like any other family — playing games and eating together and snuggling and going to sleep. Such a sweet one! Full Full Full of Love, by Trish Cooke and illustrated by Paul Howard: I absolutely adore baby books you can nearly sing because their prose is lyrical and perfectly rhythmical. This is one of those fabulous stories, all about a child who goes to dinner at Grannies and is so full — full of hugs and kisses, tasty dishes, happy faces and so much love! A fabulous diverse baby book that I guarantee will be on heavy rotation in your home! DIVERSE BABY BOOKS: Concepts - Colors! Golden Domes and Silver Lanterns: A Muslim Book of Colors, by Hena Khan and illustrated by Mehrdokht Amini : This diverse baby book is exquisitely gorgeous, and such a beautiful one to use to teach your kids their colors! Celebrate Islam’s beautiful traditions, from red prayer rugs to blue hijabs, with the help of a Muslim child as narrator. Such a perfect way to learn about world religions and cultures! We also love Crescent Moons and Pointed Minarets: A Muslim Book of Shapes! Holi Colors, by Riba Singh: This is a wonderful, vibrant tribute to the Hindu holiday of Holi, which is known as the festival of colors and the festival of love. It symbolizes the end of winter, the beginning of spring, and the victory of good over evil. This diverse board book contains lively photographs and clever rhyme, walking toddlers through all the colors on the rainbow while simultaneously teaching about a special Hindu celebration. Stunning! 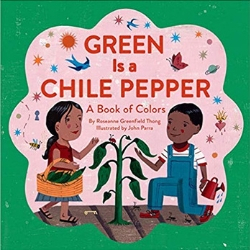 Green is a Chile Pepper, by Roseanne Greenfield Thong and illustrated by John Parra: Oh, I simply adore this book, that uses Mexican American culture to explore colors! With its vibrant illustrations, bilingual text, and snappy rhyme, this fabulous book has universal appeal. It’s a perfect read aloud for babies and toddlers. Even better, the glossary in the back of the book explains any vocabulary you don’t already know! We also adore the other books in this series, including Round is a Tortilla and One is a Pinata! DIVERSE BABY BOOKS: Concepts - Numbers! Besos for Baby: A Little Book of Kisses, by Jan Arena and illustrated by Blanca Gomez: Everyone wants besos in this sweet counting book, from Mami to Papi and even perro and gato! The bilingual text, the energetic rhyme, and the bold, sweet illustrations make this a diverse baby book you will absolutely love.. So much fun! Kiss by Kiss, by Richard Van Camp: One kiss, two kiss, three kiss, four! This is the most adorable counting book, and we love it even more for its gorgeous photographs showing a diverse group of men, women and children, and for its bilingual text (it is written in English and Plains Cree!). Stunning, sweet, and oh so much fun. Who doesn’t love learning to count kiss by kiss? DIVERSE BABY BOOKS: Concepts - Shapes! Round is a Mooncake: A Book of Shapes, by Grace Lin and illustrated by Rosanne Thong: This is a diverse baby book that incorporates Chinese culture into a book that will teach your children their shapes! From the round rice bowls to square dim sum boxes, we adore this one and the way it helps toddlers learn the significance of the mentioned objects while also teaching them importance concepts! Cuauhtemoc: Shapes-Formas, by Patty Rodriguez and Ariana Stein and illustrated by Citlali Reyes: Did you know that Cuauhtemoc was the last Aztec emperor? Now you do! And you can explore the city of Tenochtitlan right along side him. On your journey, you’ll discover all sorts of shapes, including the triangulo in the pyramid and the circulo in the Aztec calendar. A fabulous diverse board book to introduce your child to both English and Spanish vocabulary for shapes. DIVERSE BABY BOOKS: Other Concepts! Making Faces: A First Book of Emotions, by Abrams Appleseed: This is another one of our favorite diverse baby books. Babies in real photos make faces depicting various emotions, namely, happy, sad, angry, surprised and silly. The reader is asked to match the emotion to the baby face, and then to make their own faces. The mirror at the end of the book makes this one a total winner. Love! My First Jewish Baby Book: Almost Everything You Need to Know About Being Jewish, from Afikomen to Zayde, by Julie Merberg and illustrated by Beck Feiner: Teach your child the ABC’s and learn Hebrew, Yiddish, holidays and cultural references at the the same time - bagels and brisket, anyone?! This book provides a fun and informative way to introduce your toddler to the beautiful traditions of Judaism. Baby’s First Words, by Stella Blackstone, Sunny Scribens, and Christiane Engel: We adore this diverse baby book of first words! Why? Just look at that beautiful cover, with its diverse representation and alternative family structure. It is simply wonderful, and I love the way it tells the child’s journey as she goes about her day. We love diverse books, and this is such a great introduction to vocabulary for little ones! Did you like our list of diverse baby books? We are so glad! Check out these fantastic posts - we think you will love them too! Ten of our Favorite Unique Baby Books! Best Board Books: Dear Zoo, a Lift the Flap Favorite! For more information on diverse books, we highly recommend checking out these fabulous sites: We Need Diverse Books and Multicultural Children’s Book Day.